Check out the new class we've added!!! Check out the class that Faith of Everlasting Keepsakes has agreed to teach for us! I fell in LOVE with this project when I seen it and am so excited that she's agreed to teach it for us!! It will be taught on Saturday, November 10th from 8:30-9:30am. There are ONLY 14 seats available!! Register today, you're going to LOVE this class!! Be sure to check out the other classes available. We have incredible talent, awesome projects and fantastic prices!! http://www.kisscropnshop.com/. Pre-order your Lights, Camera, Scrapbook! Shirts today and SAVE!!!! Pre-order your Lights, Camera, Scrapbook! shirts by Friday, November 2nd at 2:00pm and SAVE $2.00 per shirt!! All shirts will be pink with black and red ink, there will be glitter and shine on these fun shirts!! **The long sleeve t-shirts may be black with red and pink ink and glitter!! To pre-order yours today and save $2.00 per shirt off the prices shown, EMAIL Shannon at info@kisscropnshop with shirt size, name and type of shirt wanted. Remember, orders must be recieved no later than 2:00pm on November 2nd to get the discount!! You can also call at 417-540-5072. Orders will not be taken on the website and you will pay at the time of pick-up! We will have shirts for sale at the KISS Crop-n-Shop event but they will be limited in number and sizes so order yours today!! Loving TLC and they're back....new face, same great product!!! Hi there my name is Rosalinda. Oh my goodness time does definitely fly! This is my first time attending the KISS Crop-n-Shop and I am so excited!! I cannot wait to be there to show off some of TLC's (Top Line Creations) latest products. In case you've never heard of us, we have the most diverse scrapbooking collection for both paper and digital lovers. We provide a wonderful line of products that are absolutely safe for your pages but also save you time. Our themed kits come with coordinating papers and embellishments. From our cardstock, printed paper, matching ribbon, rub ons, printed paper, album and AFFORDABLE kits, we have everything you need to help make your pages spectacular. Feel free to visit my website: www.topline-creations.com/ScrapTLCStyle to have a preview of our products. If you cannot wait until the crop in November, feel free to place your order directly from my website and your order will be mailed directly to your house. **Orders placed by Friday, November 2nd will be delivered at the KISS Crop-n-Shop Event with NO shipping fee!!! Croppers: I will be offering a make & take just for you!! Join me as we make an adorable Christmas page perfect for any 6x6 mini album. I am so looking forward to meeting you all! We are so happy to be a part of KISS this year and would like to introduce ourselves. We are a mother/daughter team that formed Scrapbooking Momeez over 4 years ago. We started with handcrafted embroidered stickers and continued to grow with our custom services and original designed kits. We love teaching and especially cater to the new and beginning scrapbooker. For quick and easy scrapbooking we put together our own scrapbook design kits that include color pictures and simple cutting diagrams for quick and easy page layouts. 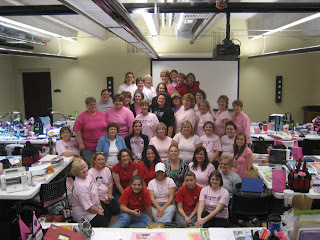 We now have consultants across Missouri that put together Scrapbook Clubs to walk you step by step through our kits. We are excited to say we have a consultant in the Joplin area, Angie Ashens. She will be helping us on Saturday at our booth. So….have you heard of the Scrapbook Retreat/Getaway in Rogersville, MO yet??? Well in May 2007 our dreams came true when we joined with a very good friend, Debbie Hightower to open “Our Memory Cottage”, Home of Scrapbooking Momeez. 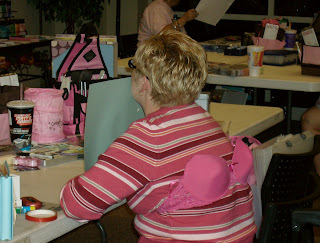 The cottage is a year round weekend retreat with the Scrapbooking Momeez store located on the bottom floor. Now that we are a brick and mortar store we also have great scrapbooking supplies from many different companies. At our booth we will be showcasing products from 2 different companies. Take a minute to check out their websites: “OneHeart-OneMind.com” located in Kansas. This company is merging scrapbooking, card making and gift giving; “ArticFrog.com” located in Arkansas. If you have pictures of kids, this company has some great products to help showcase those pictures! We also will be bringing products from Bo Bunny, Karen Foster, Creative Imaginations, Die Cuts with a View (solid papers) & More. From adhesives to a smattering of embellishments and papers for the holidays and special occasions we hope we’ll have what you need as you scrapbook the weekend away! Please stop by our booth. We would love to meet you and show you pictures of the cottage. Jen has agreed to let me run a special on this class..... it's an adorable mini album that would make a great gift for grandparents, distant relatives, even yourself!! Learn fun techniques, play with cool papers and get a free gift when you take this class!!! While signing up for this class be sure to check out Jen's other classes as well as those offered by the many talented teachers we have attending this year!! Just a few more days left to register for classes!! Cindy was highly recommended by the Paper Kandi Co. gals so you know she's got talent, she's fun to be around and she's a great person..... Here's a little something from Cindy. There is nothing so fine as the feel of paper and the sound the trimmer makes slicing through it. The feel of the paper is how I began my twelve year addiction. My head spins to think of the possibilities for the paper available. Stamping, quilling, piercing, piecing, embossing, inking, tearing, layering...oh how can I go on? Several classes later, both as student and as teacher,I have enjoyed every moment. The birthday cards we will be making will easy and fun. They are easily adaptable to personalize for friends and family. A touch of ribbon here or there and you've changed it again. The Christmas cards are easy to reproduce in mass quantities. The pop up will be super simple to make twenty in a hour or so. You will be surprised at the easy tips that will make your card giving season fun. Classes are informative and fun for all. Creative ideas from every day life can be morphed into cards and pages. I hope you enjoy and learn as well as bring a new view to the class. Everyone has a tip or technique to share. Cindy is teaching Crazy for Christmas Cards! and Whose Birthday? Give 'em a Card class on both Friday and Saturday. Be sure to check them out!! Hello everyone! Can you believe it is just a little under two weeks left until the KISS Crop-n- Shop? I am so excited, I'm sure you are too! I know I've got a lot left to do to get ready, but it is so worth it. This year will be my third year participating and teaching at the crop. It also marks my third year as a Close To My Heart Independent Consultant. Oh boy has it been a wonderful three years. I so enjoy all of the innovative products and new products that Close To My Heart offers. You'll have to drop by our booth and take a look at all of our great products. Also, as a cropper, be sure to do our make-n-take. We will be using our adorable My Acrylix "Snow Friends" November Stamp of the Month, to make a cute Christmas ornament. You can even use it as an accent to a "Snow" page. Also, again this year I will be teaching a class called "Autumn Splendor", a two page 12 x 12 layout that is being offered on Friday at 5 pm and again on Saturday at 1:30. To register for this class, click on "Autumn Splendor" from the classes link at http://www.kisscropnshop.com/. Wanna see what we are manking for you? Mom and I are busy, busy getting ready for the Lights, Camera, Scrapbook! crop. 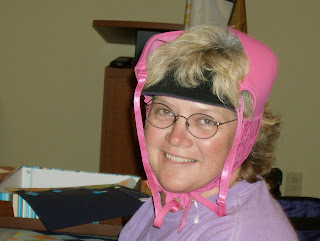 Here's a picture of my mom after she finished her project of the day. Can you guess what we are up to???????? Like taking classes? Having fun? Learning something new? Then you've got to take some of the classes being offered at the K.I.S.S. Crop-n-Shop Event to be held November 9th and 10th!! You do not have to crop with us to be able to take classes and I guarantee you won't find more quality classes and such a great value anywhere around here!!! Hello ladies! We are so excited to be returning to the KISS show this year. Last year was our first year with you all and we met so many wonderful friends. We can’t wait to spend another two days with you. We’ll be teaching 4 classes this year that you won’t want to miss. Several adorable mini albums perfect for last minute Christmas gifts and a beautiful Christmas layout using one of Daisy D’s newest Christmas papers. And as always, we’ll be playing with our newest Chipboard lines! Be sure to stop by the KISS booth to shop our latest creations including our sequel to the popular Framedangoes line. Series 2 is finally here with even more fun, ornate shapes to add to your collection. We will also have all of our alphabets and the addictive Cuddles nested chipboard shapes with us too. We can’t wait!!! See you in November! Faith and her husband are the masterminds of Everlasting Keepsakes. They specialize in chipboard products of all sizes, shapes and designs. Their product is amazing and Faith's classes are even more so. If you haven't had a chance to meet her, she's this petite blond with the biggest smile and even bigger heart! You can tell she loves what she is doing!! We recieved nothing but high praise from each of her classes last year and the best part, she is very limited on how often she teaches and she has chosen to teach at our event!! Run now over to http://www.kisscropnshop.com and check out her classes as well as all the others we have to offer!!! Can't attend a class at it's scheduled time? That's okay, you may purchase class kits for most of the classes offered this year!! Note from Alexandra's House - Community Service Recipents, PLEASE READ!! This is why we are doing what we doing, creating pages for these families and their babies!! In February at just 19 weeks tragedy struck a second time when we went to the doctor for a routine sonogram. On that day, Arianna was diagnosed with a diaphragmatic hernia. Her stomach contents were in her chest which pushed her heart over and gave her lungs little chance to grow. After a trip to Children's Hospital of Philadelphia we knew the prognosis was grim. Her birth defect was severe and she had little chance of survival. We now know that she also suffered from DeLange syndrome, a chromosomal abnormality associated with diaphragmatic hernia. We gave her the best possible chance at life by delivering seconds from a children's hospital which could offer her ECMO, but after an unsuccessful three-hour procedure, the ECMO would not work. The syndrome from which she suffered had also caused her to be small and at 37 weeks, she was just to little for ECMO to work. So, we held her, touched her, kissed her, and loved her for the remaining hours she could spend with us. Then, we laid her to rest with her brother Aidan. Now Collin has two angels up in heaven watching over him and we have two empty holes in all of our hearts because we miss them so much...each and every day. "Great sadness, great tragedy digs holes in our souls where we can put great beauty." Through this terrible tragedy there has grown great beauty. One of the greatest gifts we received was the love, friendship and support of Patty Lewis, founder of Alexandra’s House. She was there to help us love our baby, welcome her into the world and ultimately, say good-bye. Because of Patty and Alexandra’s House volunteers we were not alone as we navigated the endless doctor visits and tests. The scrapbook pages you create will be given to families in circumstances not unlike our own. In these pages they can preserve their thoughts, prayers, and memories. And, in their grief they will return to those pages for comfort as they remember. Know that you are doing a great work! Diva Designs is excited to be returning to the KISS Crop-n-Shop event for their second year! If you attended last year you might remember that Diva Designs can be your solution to those hard to shop for friends and family members on your Christmas list! We take pride in our approach to helping you use your scrapbooking tools, talents and techniques to alter just about anything and this year we have an even bigger selection of alterable projects for you to choose from. You won't believe the project ideas and variety of unique products you will find in our booth. Clock kits, ornaments, tins, magnetic easels, wood blocks and shapes, open-up albums, altered cookie sheet projects, a large selection of chipboard albums, and more! And don't stop at just Christmas ideas - you will find gifts and projects you will want to plan out for the whole year - like Mother's Day, teacher appreciation, birthdays, home decor and more! 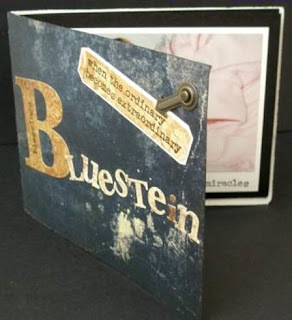 If you have never tried altered scrapbooking/art then stop by the booth and let us show you how easy it can be. We love to share our ideas and inspire you to use your scrapbook tools and stash in new and creative ways. We also stock several high-quality products to assist in the altering techniques that we recommend and would be happy to help you get started. Just be careful - altering projects can be addictive! It is so much fun to decide on a project or gift idea and see it come together and then be able to share it with someone you care about - of course sometimes you love it so much you may want to keep it for yourself! We also hosts crops in Kansas so if you and your girlfriends are looking for an excuse to hit the road and get in some more cropping time ask us about our fifteen hour and 36 hour 2008 events! Everyone that signs up for the Diva Designs Email Newsletter will be entered into a special prize drawing!! Welcome back Diva Designs!! I'll be looking for some more gift projects from you this year!! K.I.S.S. Crop-n-Shop Scrapbook Events offers plenty of shopping and tons of fantastic classes for those unable to crop with us at the Lights, Camera, Scrapbook! Crop. That's right, you don't have to crop with us to take advantage of the FREE shopping or the awesome line-up of classes. Shopping will be open Friday, November 9th from 10:00am t0 6:00pm and Saturday, November 10th from 10:00am to 5:00pm. Come check out 10 plus stores all under one roof for FREE!!! Classes are offered from 8:30am to 5:30 both Friday and Saturday, November 9th and 10th. To view class descriptions and to register visit http://www.kisscropnshop.com. Hi everyone!! I can’t wait for my first time to teach at KISS Crop-n-Shop. I met some of you when you visited my booth at the Creating Keepsakes convention in Tulsa. Here’s a picture of me in my booth after set up day – notice the worn out expression and ponytail! It was tons of work to set up and run that booth, but I don’t know if I’ve ever had a more exhilarating experience. Well, ok, maybe it comes in a close second to the birth of my children! The group that I met in Tulsa seemed like an amazingly FUN bunch of ladies! So I know that we are going to have a great time in my classes. I’m teaching four fabulous classes. The first one is a simple and sophisticated layout titled F is for Family. The other three classes are super mini albums. You may have seen them in person in the booth in Tulsa – they were all out there as samples. And I had tons of questions about how to make them! So I can’t wait to share with you how to do it. Oh, and if you didn’t get one of the wooden bone folders that I was giving out in Tulsa, you’ll be getting one at the class. It’s a fabulous little tool to have handy! I’ve been a scrapper and stamper for nearly 10 years and have been teaching classes for 5 years. For the last three and a half years, I’ve had my wings and been an angel with The Angel Company. You may not have heard of The Angel Company yet, but you are going to love our products. We’re going to use several of our beautiful paper lines and some of our awesome stamps on the class projects. I love my angels and currently have 27 angels on my team in 10 states. Last year I became one of the top 10 recruiters for The Angel Company just by sharing my love of papercrafting. Jen will only be able to be with us on Friday of the K.I.S.S. Crop-n-Shop Event so be sure to checkout her classes, they will only be offered once during the event!!! Hi ladies, Melissa Lewis here!! I'm very excited to tell you that I've started selling Stampin' Up! prodcuts!! I love all the products they have and can't wait to share them with you. In fact, I will be demonstrating different techniques though out the weekend at my booth. I will also have several hand-stamped samples as well as hand-stamped cards for sale. Be sure to stop by and say hi!! I'm also pleased to announce a special offer for all that are attending the K.I.S.S. Crop-n-Shop event. We all know that waiting on our new goodies is very difficult so I'm running a pre-show special. Make any purchase from my online catalog prior to October 29th and I'll deliver your goodies to you at the show. In addition you will receive a coupon for 1 FREE future Stampin' UP! class of your choice. To view a catalog you can go to http://www.stampinup.com/ and click on "Our Online Catalog". To place an order you can either contact me by phone at (417) 438-0913 or email me at melanno@yahoo.com. If you are unfamiliar with Stampin' Up! here is a little information about them!! Stampin' Up! is proud to offer the most beautiful, affordable, high-quality stamps and accessories you can buy. We make our stamps of premium wood and rubber to guarantee the best impression possible. 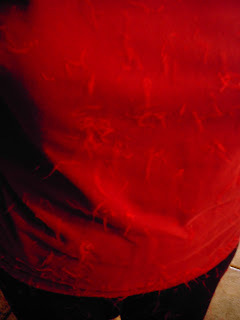 Because you assemble the stamps, you save dramatically on cost--and you can position your stamps to suit your style! With Stampin' Up! products, you will experience newfound imagination and creativity. We offer hundreds of exclusive stamps and accessories for home décor, greeting cards, scrapbook pages, and more. 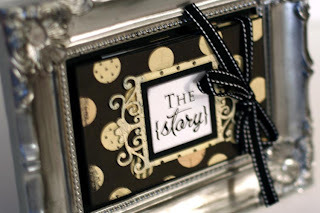 A word from Shannon: LOVE the new white pens Stampin' Up! sells, you'll have to ask Melissa which one it is but I LOVE mine!! Works great on the new acrylic albums and just about everything else I've tried it on!!! Love them!! LOL!! We are almost sold out of crop seats at the November, Lights, Camera, Scrapbook! Crop!!! There are only 22 seats remaining so get your friends in gear!! They don't want to miss out and to those that have already registered!! THANK YOU!!! I'm soooo excited for this year!!! Now, go call those procrastinating friends of yours!!! Tammy and I are super excited to be part of the K.I.S.S. Event in Carthage on November 9th and 10th. We hope everyone is registered and can't wait to see you there!! We are being sponsored by Cosmo Cricket and Oriental Trading Company and hopefully you will love the projects as much as we do! 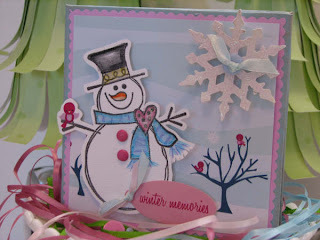 For our Winter Wonderland Book we have used the newest paper line from Oriental Trading Company and it is super cute. In our Holiday Garland we have used the new large chipboard shapes and new Christmas line from Oriental Trading Company. In both of these classes your pack includes extra goodies and we will be giving away some great prizes!!! Our Naughty or Nice Wall Hanging is so cute and the paper is awesome. We will be using ribbon, chipboard and a fantastic paper line by Cosmo Cricket. You will receive a lot of extras in this class as well! Tammy and Darby - PS We are bringing along the new fall and winter catalogs from Oriental Trading as well as a fun make and take!!! Labels: Cosmo Cricket, KISS Crop-n-Shop Scrapbook Event, Oriental Trading, Paper Kandi Co. I share a birthday with two great friends!! Happy Birthday Miss Hailey - the best helper around and Toni, my always there prayer partner!!! Hope you had as great of a birthday as I did!! Mine started on Sunday when my Sunday class surprised me with a cake and lots of little goodies!! I was so surprised that I know my face turned red and it got really hot in the room, although that's probably from all the candles on that cake!! LOL!! Today, my mom and I spent the day just goofing off (and shopping for crop goodies) but we laughed all day!! Thanks to all those that called, emailed and sent birthday wishes!! I feel so blessed to have so many great friends, many I would never have known if not for scrapbooking!!! Hugs to all of ya, enjoy your week!! Meagan Sabo..... read what she has to say. Hello! I’m so excited to be teaching another class at the KISS Crop-n-Shop. It’s been so much fun to participate in the past couple of years and I’m looking forward to another great year. My class will be a two page 12 x 12 layout and a card focusing on distressing techniques. I am a Close To My Heart Independent Consultant and we offer a brand new distressing kit that is awesome! This is my new favorite must have item. We will focus on this kit and everyone will go home with the layout, a card, plus a free Edge Distressor. Of course all of our items are acid free, buffered, and safe to use in our scrapbooks. Check out the fun picture of my partner, consultant Monica Madden, and myself in front of our display items from teaching at a Close To My Heart Convention. I love sharing with others something that I love to do. If you have any questions about my class, the great Close To My Heart consulting opportunity, or about earning free supplies by hosting a gathering or joining a club please visit: http://www.stampideas.myctmh.com/ and contact Shannon today to reserve your spot in our fun and informative class. Are you going to the Creating Keepsakes Show? I still have discounted shopping passes for the Creating Keepsakes show in Kansas City on the 19th and 20th. If you are planning to go email me at info@kisscropnshop.com for ticket information. You'll be happy you did!!! By the way, while you are there be sure to wear your KISS shirt for a chance to win fun goodies from me. I'll be teaching for Lickety Split Scrapbooks at the show as well as working in the booth so be sure to stop by and say hi!! Will you help me? It's really very simple.....TELL EVERYONE YOU KNOW.... about the K.I.S.S. Crop-n-Shop Event to be held November 9th and 10th at the Fairview Christian Church in Carthage, MO. There will be shopping, shopping and more shopping....classes, oh my are there classes and of course the very best crop in the area will be taking place!! Can't crop? That's okay, take a class!! Can't take a class? That's okay shop!! I KNOW everyone knows how to shop!!! :-) We have some awesome vendors coming in for your shopping pleasure. Stay tuned over the next thirty days you are going to get to meet our vendors and see our classes. So don't walk... run to the phone and the computer! I know you can multi-task!!! Call and email all those in your favorites lists and then those that haven't made it to the list yet and give them the scoop on the craziness happening November 9th and 10th!! They'll love you for it!! Honestly, I do need your help!! I have flyers printed and ready to go, if you have a place that will allow flyers to be displayed please let me know. Tell all your friends, neighbors, co-workers, school teachers, heck even your family!! We want to make this show bigger and better each year and we can only do that with your help!! Thanks, back to scrapping now!! LOL!! Thanks to all that shopped with us and took classes with us this past weekend at Scrapology. I always love going to this part of the country, you all make me feel so welcome and at home. It's awesome to see so many familiar faces and get those fantastic hugs from ya!! Enjoy all your new found goodies and I'll see ya at the next event!!! Thanks also for the generous donations to the Susan G. Koman fund in honor of our bra designers!! What fun to get to share the fantastic designs with so many of you and I'll be sharing a special picture with all of you soon....hint...Rusty Pickle employee, bras, blackmail....LOL!!! I can't say anymore, I'll let the picture do the talking when I get it!! Just a reminder that the Crop for the Cure in Greenfield is this Saturday, October 13th. 9am - 9pm at the Greenfield Elementary School. Join us for a day of fun and let's raise some money for a great cause!! It's only about 1 1/2 hours from Joplin so gather your friends and follow me to Greenfield!! Registration is still open for this event, we'd love to have you!! Class registrations will also end on October 30th in order to give our awesome line-up of teachers time to prepare. HAVE YOU CHECKED OUT THE CLASSES YET? THEY ROCK!! That's all the reminders I can think of right now!! Have a great week! As promised....here are the pictures!! Scrap Pink was a blast!!! Met many new friends, chatted with others and laughed with everyone! I promised to share pictures of all the fun so here are a few. Enjoy!! The group picture was a bit difficult to get and we missed getting those that joined us on Friday night. I joked that we were going to need to rent a seperate wing for some of these ladies and all their stuff!! LOL!! We had groups from Kansas, Arkansas, Oklahoma and of course Missouri attend this event!! What a great group of ladies, they sure know how to eat!! We had so much food in that kitchen that it felt sinful to walk in to it and it sure made you waddle when you walked out!! 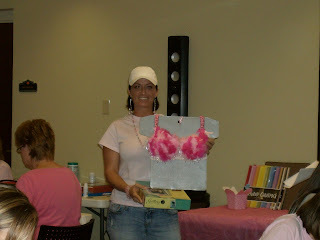 Congrats to Lisa, 1st place winner with her light up bra!! It was too cool! I'll post some more of the winning bras later. You just have to see them!!! I actually have them on display at the Scrapology Event I am vending at this weekend! They are a huge hit of the show!! Thanks for sharing your talents and I'll let you know where they will be on display at next. The ladies had fun finishing layouts so they could have the Pink bra!! We seen some creative ways to wear bras to say the least and there was some major competition to see who would have the bra when the timer went off!! It was pretty funny the first few times I heard someone walk up to another person and ask for their bra!!! What an honor it was to share the weekend with all of you ladies!! I truly appreciate each and every one of you!! Thanks again for supporting such a fantastic cause, for supporting my business and my family!! I'm so honored to call each of you a friend and look forward to seeing you again soon!! One last picture for now..... because there is ALWAYS one TROUBLE in every group!! !